Weight distribution with the protection grating and movable axle. You may already know that the protection grating, located on the front frame of the trailer, is movable to allow transport of logs of different lenghts. 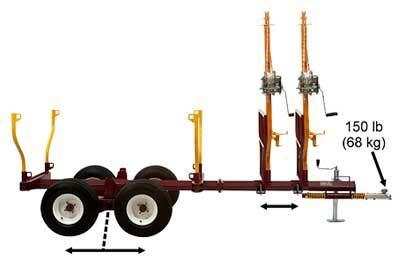 But did you know that this capability allows to adjust the weight on the trailer tongue as well? In fact, moving the protection grating (or the axle position on the rear frame) has a direct effect on the weight distribution on the trailer. It is thus possible to balance the load properly. The first step is to look at the axle alignment in the rear frame. You should have the axle exactly in the middle of the frame. Depending on the lenght of the logs to be hauled, you should position the grating a bit more than half the log lenght from the axle mid-point. Then, line up each log with the grating while loading. You can feel the weight on the tongue by lifting it. If it lifts easily, you are not adding much weight (and traction) to your ATV. You may experiment to find our what gives the best results for you. And remember, you dont need any tools to move the grating, except for your bar wrench with _ spark plug socket. You will find that proper weight distribution will make log forwarding much easier  and safer.